MP Damian Collins said senior figures at the association, including chief executive Martin Glenn, had “difficult questions” to answer in relation to the Mark Sampson scandal. 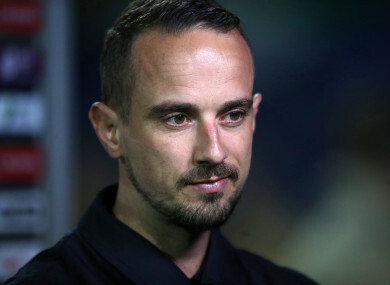 Mark Sampson was sacked as England Women's Manager yesterday. A LAWMAKER ON Thursday accused the Football Association of an “inexcusable” lack of leadership following the sacking of England Women’s manager Mark Sampson for “inappropriate and unacceptable behaviour” during his time at a previous club. Sampson had been the subject of accusations of racism, harassment and bullying made by former England player Eni Aluko. But the 34-year-old Welshman, cleared over those allegations, has instead been dismissed by the FA following a historic safeguarding investigation into his conduct while manager of Bristol Academy. Sampson, who last year agreed a new contract to remain as national team coach until 2019, was axed less than 24 hours after taking charge for England’s 6-0 Women’s World Cup qualifying win against Russia. MP Damian Collins said senior figures at the FA, including chief executive Martin Glenn, had “difficult questions” to answer over why they took so long to look into the “incredibly serious matters” in Sampson’s past. And he warned that heads would have to roll at the governing body if it could be proved executives had failed to heed warnings about the manager’s conduct. Collins, the chairman of the House of Commons digital, culture, media and sport committee, told Sky News: “They (the FA) have based their decision (to sack Sampson) on this historical investigation from a few years ago. “He should never have been appointed in the first place and action should have been taken a long time ago. Aluko will give evidence to MPs on the committee next month and Collins hopes Glenn and other FA chiefs will also attend the hearing to face questions. Sampson led England to successive semi-finals at the 2015 World Cup and the European Championship earlier this year, but the final months of his four-year reign have been plagued by controversy following a series of claims from Chelsea forward Aluko. She claimed Sampson had told her to make sure her Nigerian relatives did not bring the Ebola virus to the friendly against Germany at Wembley in November 2014. Sampson denied that claim, along with another allegation that he asked a mixed-race player if she had been arrested before, and then jokingly suggested she had been arrested four times. Sampson was cleared by an internal FA review of Aluko’s claims, and by an independent investigation led by barrister Katharine Newton. Email “'He should never have been appointed in the first place'”. Feedback on “'He should never have been appointed in the first place'”.